When most people think of UBC’s sports teams, it’s the athletes and the coaches that typically come to mind — team captains, goal scorers, dazzling duos are the faces of a team. But who are the people who help keep our athletes game ready? Not another player or a coach necessarily, but another position that — though working away from the limelight — is essential to the workings of several varsity teams: student trainers. 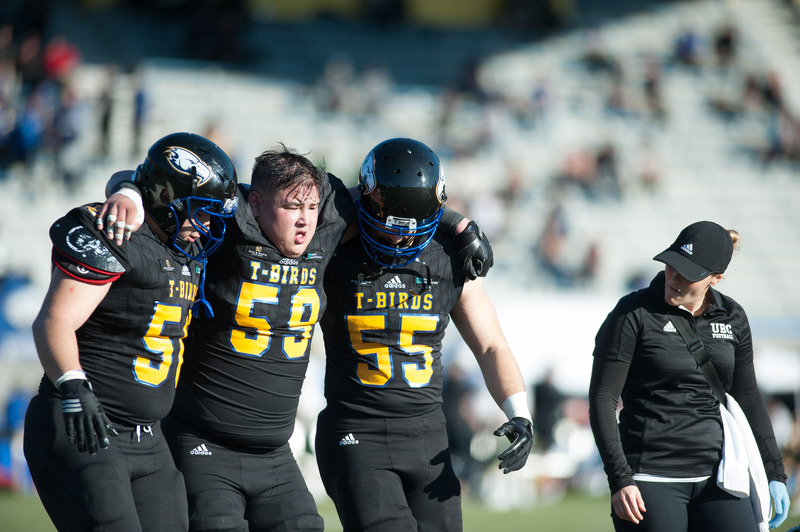 According to Joe McCullum — head coach of strength and conditioning at UBC — student trainers can be either a volunteer or graduate scholarship position at the university. Currently, there are about 25 student trainers that work with the university’s various athletic teams. The position is open primarily, but not exclusively, to kinesiology students. McCullum said that having student trainers at the university logistically eases the demanding process of providing strength and conditioning training for each team. 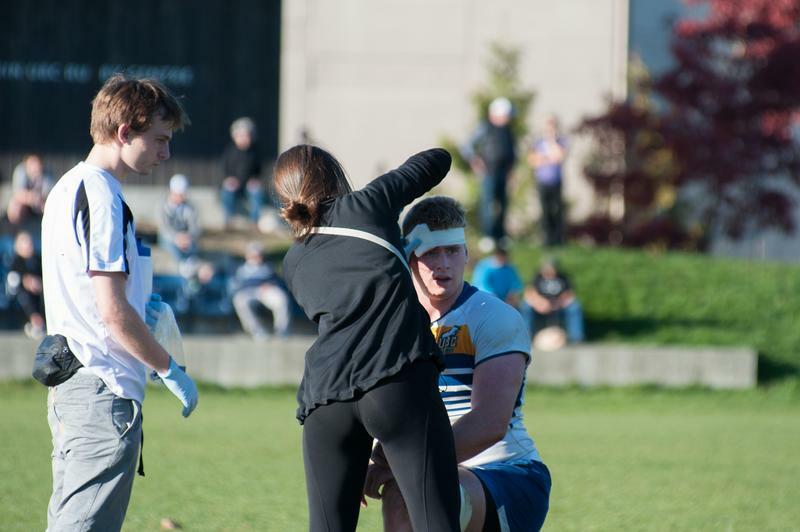 The specific duties of student trainers do vary depending on their individual skillsets and the teams they work with, but typical duties include injury treatment and leading exercise routines. Still, according to McCullum, the end goal is to give students on-the-job experience in therapeutic treatment and other related occupational fields. Devan Hawes — a third-year kinesiology student — is currently working her second year as a student trainer for the women’s soccer team. As an aspiring physiotherapist, she sees her job as a chance to put her academic knowledge into practical use. “I found in my first year of [kinesiology], you’re learning all these concepts and all these different things about anatomy and physiology, but you don’t get to apply them necessarily,” said Hawes. Admittedly, being a student trainer can be a time-consuming job for Hawes. Still, she sees the experience as invaluable for her future. “It is a lot of work … but in the long run, I think it's going to be beneficial because I get hands-on experience practicing what I’m learning,” said Hawes. For T-Bird athletes like Jasmine Mander — captain of the women's soccer team — student trainers continue to be an important part of injury recovery. In particular, Mander credits her team's student trainers for the treatment of her torn ACL during her first year, which put her out of action for 12 months. “I spent a lot of my time in my first year with … the student trainers at the time, so I have a big appreciation for what they do for sure,” said Mander. Now a fifth-year athlete, she has had extensive experience with student trainers and admires them for their overall level of knowledge in injury treatment. “Even though sometimes the student trainers are younger than me in terms of where they are in their undergrad, I’m always impressed by how much more they know in terms of the body and how to treat things,” said Mander. Mander also said that aside from providing treatment for physical injuries, student trainers also provide emotional support for athletes during injury recovery, which she sees as a crucial aspect to a team's success. Whether or not a student trainer does pursue a related career path or not, McCullum believes that the position offers a chance for kinesiology students to learn interpersonal skills, which they will need to bring into any professional workplace.